With an abundance of great music, videos, and apps that can be loaded onto our SD Cards; it’s quite easy to fill up your your storage without even realizing it. Instead of arduously trying to figure out just where all that missing space went, XDA forum member JustinBrew has a simple and streamlined solution. Using the developer’s Grid Size File Manager, you are just a pinch-zoom and pan away from finding out what files and folders are commandeering the largest portions of your device’s memory. 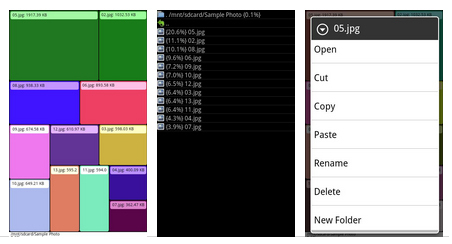 Grid Size file manager has all the functionality you expect from a file manager with a useful visual feature. The grid view graphically displays the contents of your storage drive proportional to the size of each folder and file. The grid view also supports image controls so that you can zoom and pan to view folders. What are you waiting for? Continue on to the original thread to get cracking with file management!